Available from online vendors so I will not be posting a sample. Presented here to share jacket notes excerpt. 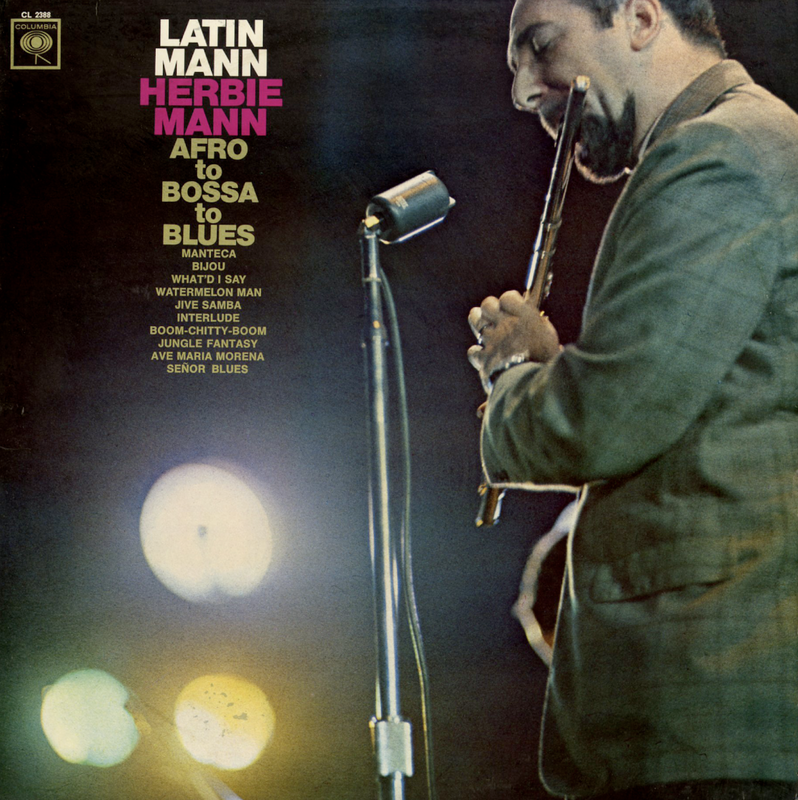 From the back cover: The careers of Herbie Mann and his sidemen have overlapped in many respects with those of the pioneers in the Latin Jazz story. 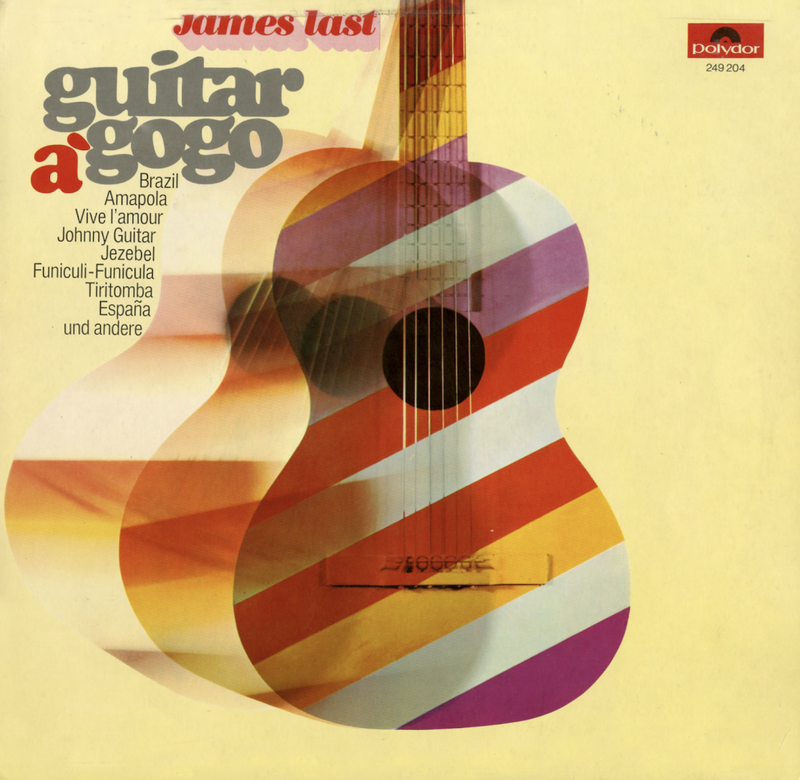 After several years of intermittent association with the idol, Mann formed his first organized Latin-type group in June of 1959 and opened at Basin Street East (known earlier as Casa Cugat). Two of Mann's present drummers, Jose Manual and Carlos "Potato" Valdes, worked in Machito's orchestra; a third, Willie Bobo, played with Tito Puente and Cal Trader. Mann himself was inspired by the late Esy Morales to take up the flute. 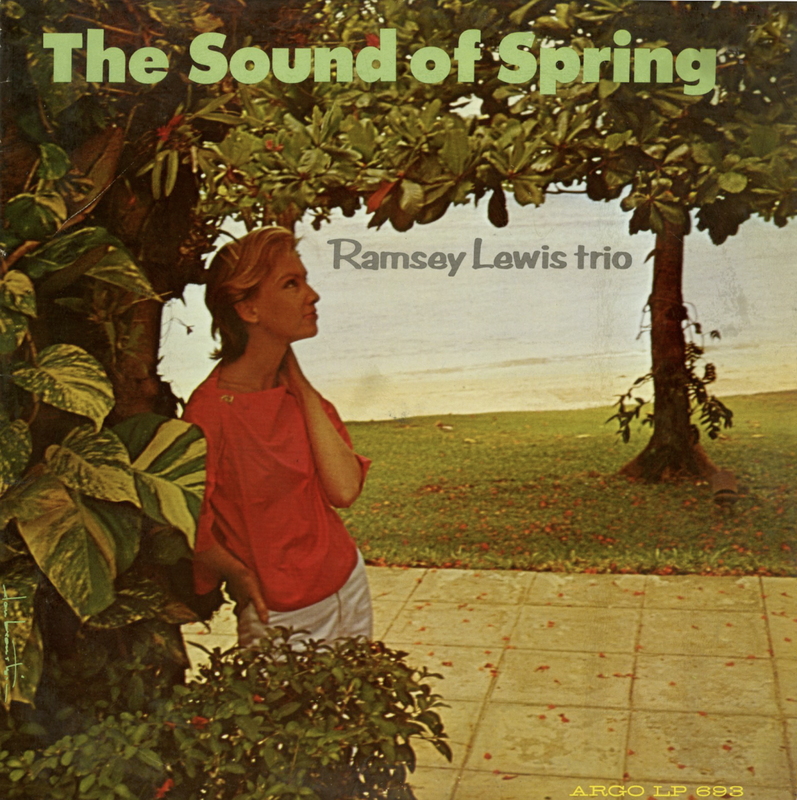 It was Morales' flute specialty, Jungle Fantasy, which Mann heard in 1952 (and which he recreates in this album), that became the first Latin instrumental hit in the general U.S. record market. "Every tune in this album", says Mann, "has some relationship to the story of the gradual blending of Afro-Cuban music and American Jazz. We include a standard Cuban song, the most popular of them all in that field, Ave Maria Morena. This tune and Jungle Fantasy were recorded with three Spanish voices, bongo, conga, timbale, Charlie Palmieri on piano, Bobby Rodriquez on bass, and myself, with no regular stick drummer. "We represent the Dizzy Gillespie-Chano Pozo tie-up with one of their greatest successes, Manteca and the Stan Kenton, Pete Rugolo Latin period with Interlude." The latter track, incidentally, establishes a slow mambo mood that is quite different from the original Kenton treatment. Mann plays the theme very beautifully on alto flute; later, his flute and Danny Bank's bass clarinet are woven intricately into Oliver Nelson's subtle arrangement. Bijou was one of the few Latin tunes associated with Woody Herman's First Herd, Written in 1945 by Herman's pianist and arranger, Ralph Burns, it featured Bill Harris' trombone. Though Mann is the featured soloist and a mambo feeling is added, parts of the new version bear a strong resemblance to the original. What'd I Say is an example of the rhythmic pulse Mann describes as "boom-chatty." He explains: "What Afro-Cuban was to Latin jazz, that's what boom-chatty is to rhythm and blues. The drummers are playing their own concepts of the conga and timbale beat. "The small band date for this album featured my regular group with Jimmy Heath added on tenor sax and Carmell Jones on trumpet. 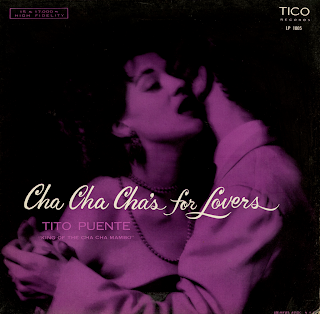 Señor Blues was another early Latin jazz hit. A lot of the jazz guys seem to feel the clave rhythm because of their heredity. Horace Silver, of course, is of Portuguese descent." Silvers' Señor Blues is played in 6/8 meter with with intriguing cross rhythms and strong solo work by Mann and Heath. Watermelon Man, written by painist Herbie Hancock, is an example of a work by a jazzman later popularized by a Latin artist (Mongo Santamaria). 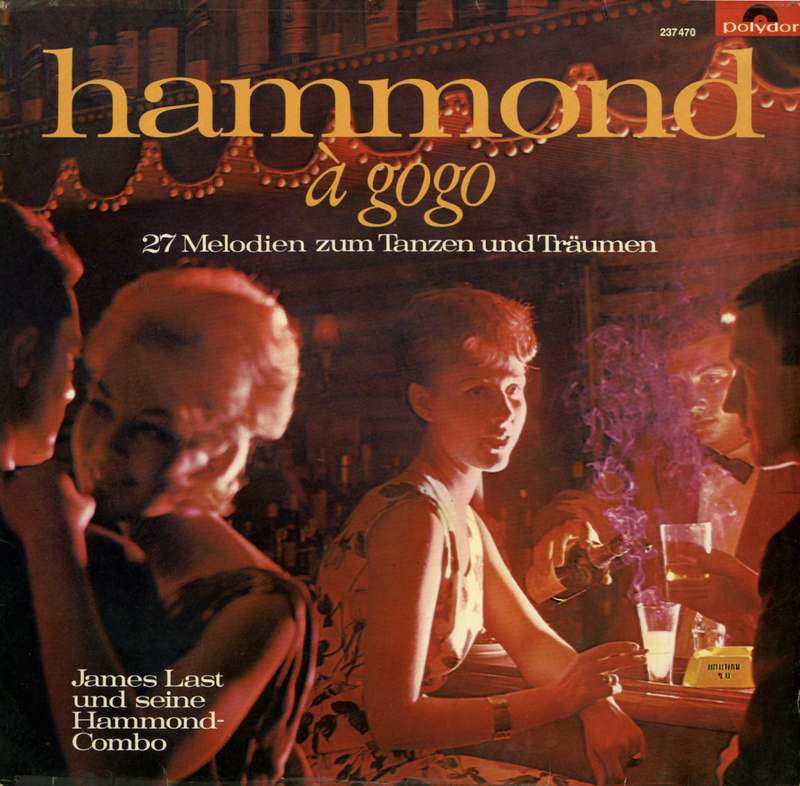 The Jive Samba, says Herbie, is "like a boom-chatty version of the bossa nova." Note the solo by Dave Pike, a Mann regular since 1961 and one of the most flexible of modern vibraharpists. 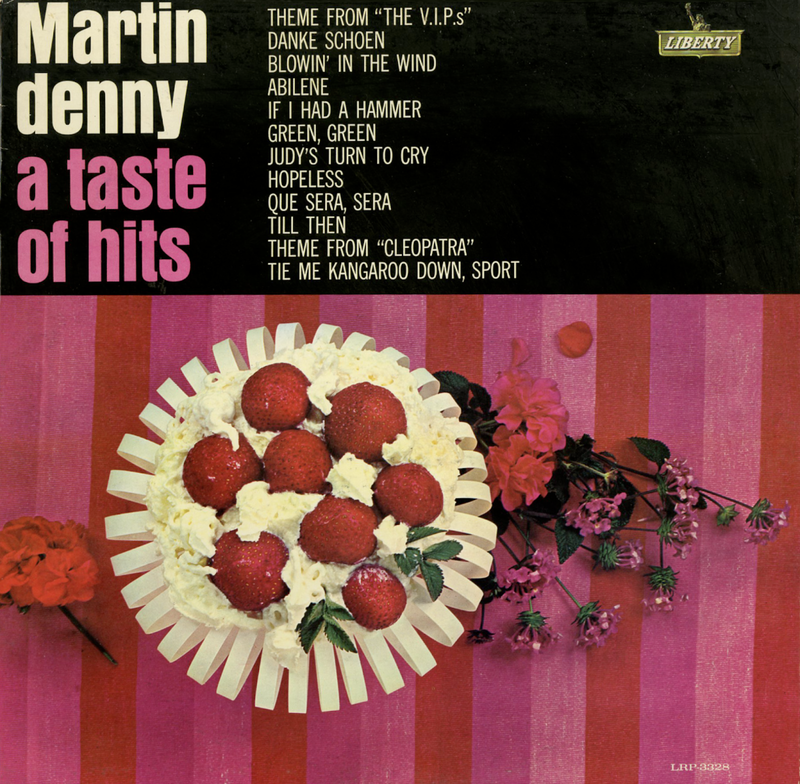 Mann's summation of his own tune, Let's Boom Chitty Boom, is simply: "This is my conception of where it's at now." The closing announcement is by the leader. As Herbie points out, a sort of Latin jazz family has developed over the past decade or so; the jazz combos interested in Latin music have often tended to trade both their Latin and jazz sidemen. Earl May, for example, Mann's bassist, worked alongside Candido Camero and Patato Valdes in Billy Taylor's combo. Mann adds that there is a modern, adaptable brand of musician on the scene who can "go everywhere from Latin to boom-chatty to jazz." He cites his gifted pianist, Chick Corea, as an example. The Latin jazz family is growing. Thank in large measure to Herbie Mann, it is also growing rapidly in popularity among non-Latin audiences. The Mann group's triumphant audience report at the 1965 Newport Jazz Festival will long be remembered by those of us who were lucky enough to be present. A closing word should be added concerning the arranger who tied many of the disparate elements in this Latin Jazz story. Oliver Nelson, 33-years old and without a touch of Latin in heredity or early background, has developed into tone of the foremost all-around arrangers in modern music. Perhaps it is ironic that the basis for the success of his collaboration with a 35-year old flutist from Brooklyn should be a pocket history of Afro-Cuban and Latin-American jazz; but today, more than ever, the idioms are learning how and where to merge. 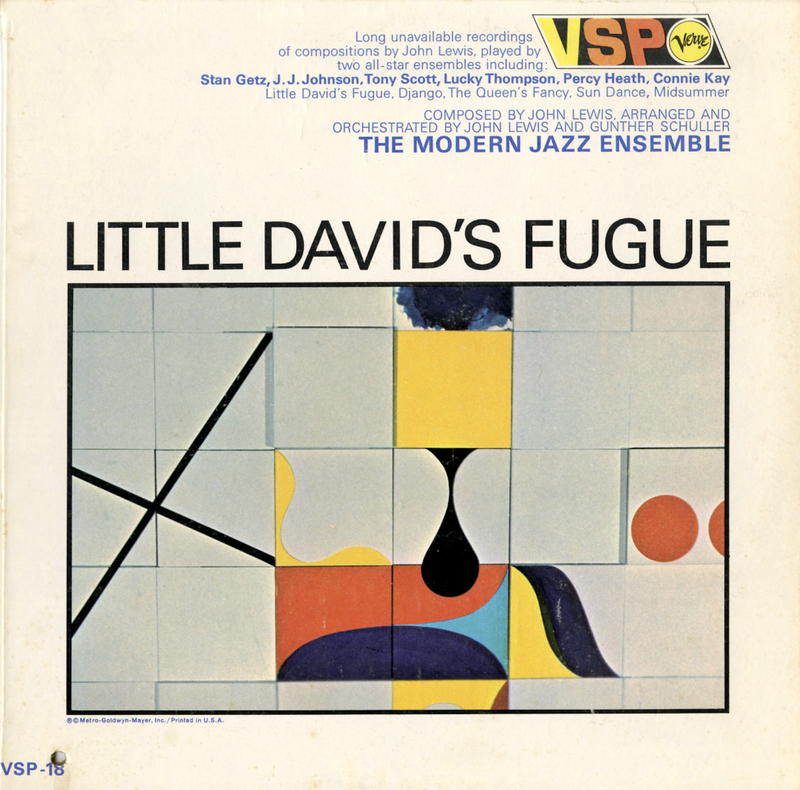 All the proof you need can be found in the variegated personnel of this album – and, above all, in the colorful, sensitive, dynamic impact of the music itself. 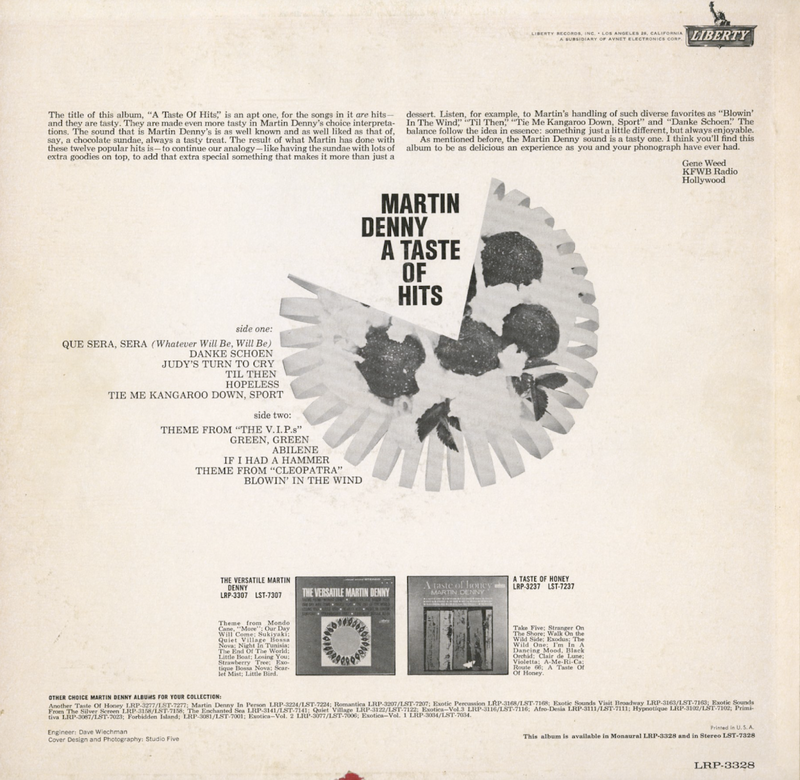 From Billboard - September 25, 1965: The jazz flutist from Latin-Afro jazz to frug and jerk-time. The cream of the country's top musicians combine to creat an outstanding album. Also from the back cover: Like pervious albums, this one is sure to delight a wide range of listeners, from those interested in strictly classical music on one end, to those interested in strictly jazz on the other. And, most of all, to that vast listening audience between these poles who like good, melodic music presented with skill and imagination... and feeling. 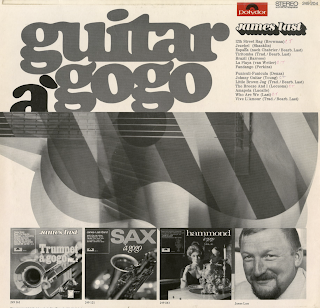 From Billboard - January 30, 1965: This unique group has made an important impression on the record industry with their imaginative and creative jazz interpretations of Bach. "Bach's Greatest Hits" has been on BB's LP chart for 65 weeks. 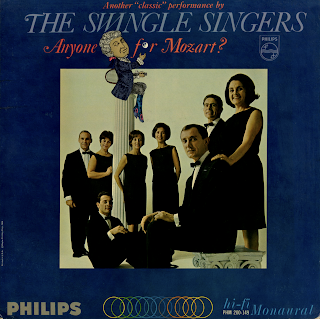 They display the same fine co-ordination of musical thought on this album of Mozart material. Stereo reproduction is excellent. 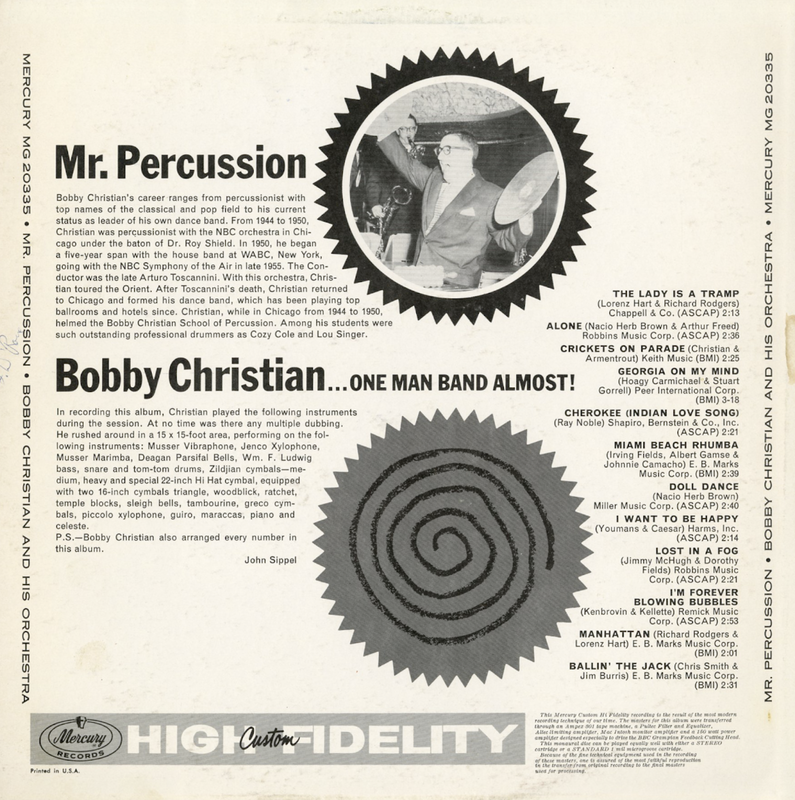 From the back cover: Bobby Christian's career ranges from percussionist with top names of the classical and pop field to his current status as leader of his own dance band. 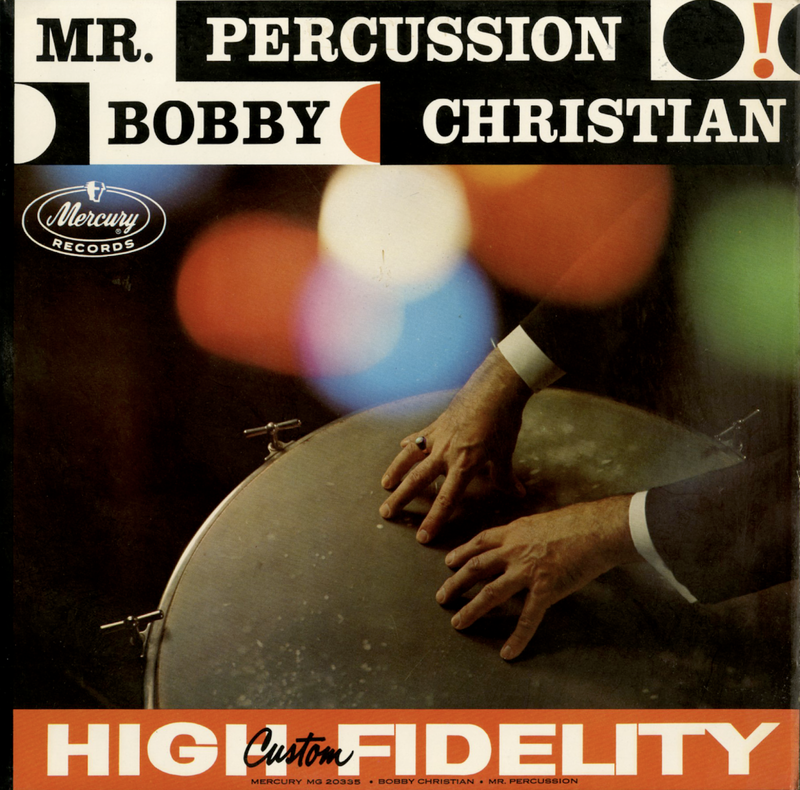 From 1944 to 1950, Christian was percussionist with the NBC Orchestra in Chicago under the baton of Dr. Roy Shield. In 1950, he began a five-year span with the house band at WABC, New York, going with the NBC Symphony of the Air in late 1955. The Conductor was the late Arturo Toscannini. With the orchestra, Christian toured the Orient. After Toscannini's death, Christian returned to Chicago and formed his dance band, which has been playing top ballrooms and hotels since. 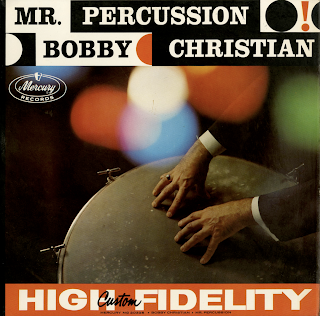 Christian, while in Chicago from 1944 to 1950, helmed the Bobby Christian School of Percussion. Among his students were such outstanding professional drummers as Cozy Cole and Lou Singer. From Billboard - December 22, 1958: A fine show-off exercise in percussion artistry by Bobby Christian, who plays everything from xylophone to tom-toms in the dozen arrangements of this album. 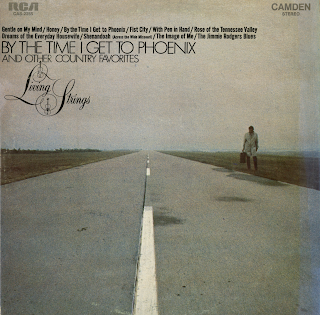 Tunes range from one of his own penning, "Crickets On Parade," to ballad evergreens like "Georgia On My Mind." It's bound to delight percussion fans, and Christian's switches between his group of instruments are unbelievably fast. He's nicely backed by a small ork. 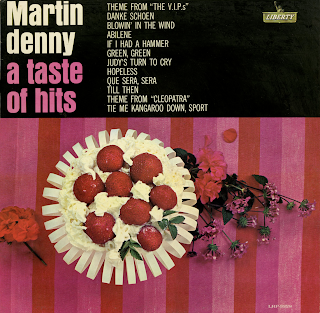 From Billboard - September 28, 1963: Martin Denny has a bright, smart instrumental LP here. The tracks are composed of tomorrow's and today's hits. Included in the LP are "Danke Schoen," "Green, Green," "Abilene" and "Que Sera, Sera." The album has swinging vibes in an informal small group setting. Available from online vendors so I will not be posting a sample. Presented here to share the cover art and jacket information. 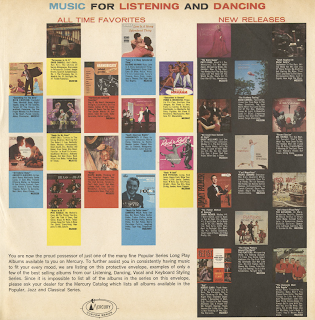 From the back cover: Recording information: Recorded March 14, 1955 in N.Y.C. 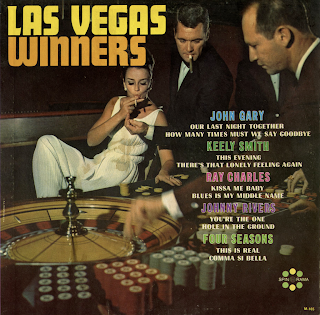 The historic performance in this album have not been available since their original release in 1955. All the music was written by John Lewis and Gunther Schuller. Two distinct groups recorded these historic tracks – Group #1 composed of J. J. Johnson, trombone; J. Politis, flute; Lucky Thompson, tenor sax; Aaron Sachs, clarinet; M. Zegler, bassoon; Gunther Schuller, French horn; J. Putnam, harp; Percy Heath, bass; Connie Kay, drums, plays: Little David's Fugue, Django and Sun Dance. 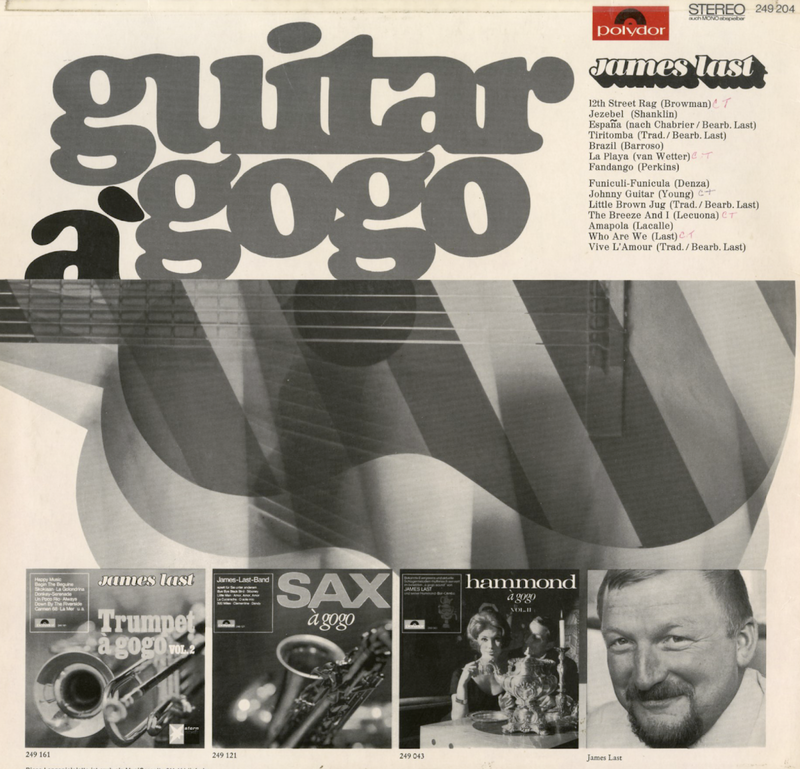 Group #2, composed of Stan Getz, tenor sax; J. J. Johnson, trombone; J. Politis, flute; Tony Scott, clarinet; M. Zegler, bassoon; Gunther Schuller, French horn; J. Putnam, harp; Percy Heath, bass; Connie Kay, drums, plays: The Queen's Fancy and Midsommer. 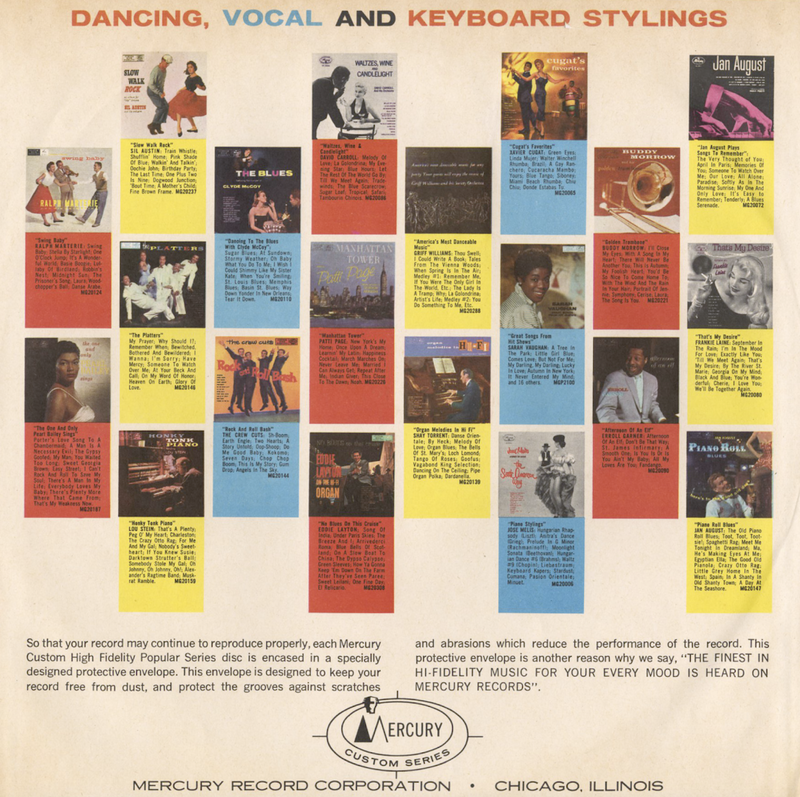 From the back cover: Born (Ramsey Lewis) in Chicago May 27, 1935, Ramsey studied privately from the age of six, later attending Chicago Musical College and De Paul University. ("However," he says, "I credit most of my musical accomplishments to Miss D. Mendelsohn, my instructress.") Music has been the focus of his life from the start: with a mother who sang in the church choir and a father who directed it, as well as two sisters who studied piano extensively; he never considered the possibility of any other career. He was an early admirer of Art Tatum and Bud Powell, but considers John Lewis and Oscar Peterson his main influences. Eldee Young, also Chicago-born (January 7, 1936) has a similar background. His father played guitar and mandolin. Eldee studied guitar with his brother, Carl; played guitar and bass in high school, and studied at the American Conservatory of Music in Chicago. 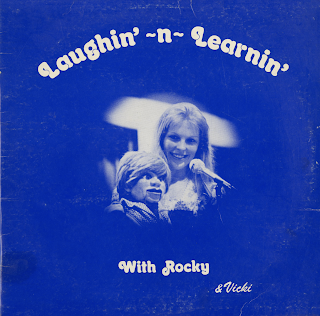 He began his professional career early, going on the road with rhythm-and-blues singer Chuck Willis in 1954. Isaac (Red) Holt, born May 16, 1932 in Rosedale, Mississippi was raised in Chicago and was a childhood friend of Ramsey and Eldee, playing with them in a teen-age band. Red studied at Crane Tech., later playing in an Army band in Germany, in 1955. 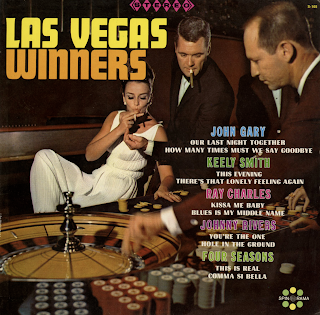 Riley Hampton, a virtual fourth wheel who makes the trio move on Side 1, is best known for his skillful backgrounds for Etta James, and was perviously associated with Ramsey in the Sound Of Christmas album. The instrumentation here includes seven violins, three violas, two cellos and the trio. It is to Hampton's credit that instead of bogging the trio down in a molasses-like wasteland of sirupy sounds, he has used the instrumentation to provide coloristic contrasts and orchestral variety. From the back cover: The first musician to make his bow also happens to be one of the original Heath sidemen. 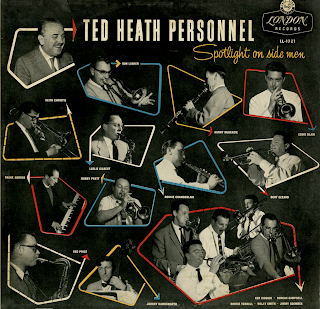 Leslie Gilbert began leading Ted Heath's reed section when the band was formed in 1945. His tone, phrasing and impeccable intonation, admired by every British alto-player, are displayed at their finest in a setting of Harold Arlen's Ill Wind. At faster tempo, Count Basie's Swinging the Blues gives scope for the unique trombone talents of Keith Christie. With his brother Ian, Keith once ran a New Orleans style band – "The Christie Brothers Stompers." Now he is one of Britain's leading modernists. "Keith has a very whimsical style of trombone playing," says Ted Heath. "Something of his dry, witty character gets into his jazz phrasing." The next musician to step forward is Bobby Pratt, Ted Heath's lead trumpet-player. "Bobby is a fabulous high-range player." comments Ted Heath, "and the longer the night goes on the higher Bobby plays. Just for amusement he sometimes plays the first trumpet parts an octave higher. "None of us can remember a day when he missed a note." Bobby Pratt's dazzling technique as well as his piquancy of his jazz ideas are shown in his interpretation of Duke Ellington's Hey! Baby, which finds him using a plunger mute with great skill. One of the six Scotsmen in the Ted Heath band, Henry McKenzie's modest, undemonstrative demeanor has caused a few critics to accuse him of lacking feeling. But Henry prefers to concentrate on music rather than showmanship. An extremely gifted instrumentalist, he plays with a warm, vibrant tone. Backed up by piano, bass and drums he performs Idaho in a deft and very individual manner. During his stay with Ted Heath's orchestra, bassist Johnny Hawkworth ("He has the personality and appearance of a youthful Alec Guinness," wrote Leonard Feather) has become one of the best-known virtuosi of his instrument. His technique is so fabulous that when dancers ask for a waltz, Johnny sometimes obliges by playing one on his string-bass. He uses four muted trombones and the rhythm section in his own intriguing arrangement of I Can't Get Started. A brisk, up-tempo version of Cole Porter's Love For Sale finds Frank Horror at his most agile. Here and there his solo playing shows trances of Errol Garner, yet Frank always remains a very individual and fluent stylist. Something of Count Basie's power-house brand of jazz is reflected in Frank's scoring for the full band towards the end of this number. One of the most accomplished of British musicians, Ronnie Chamberlain played lead alto in the Vic Lewis band before joining Ted Heath. The soprano saxophone is notoriously difficult to play and Ronnie is among the very few musicians who handle it with distinction. Lover Man has some of his most lyrical and assured solo playing. Don Lusher is usually featured in fast, intricate numbers which show off his prodigious technique. He and Johnny Keating worked out the routines of Sidewalk of Cuba together and the result is a rich, colorful performance. Bert Ezard shares the trumpet lead with Bobby Pratt. A Northcountryman, he is one of the many dance-band musicians who came into the profession through brass band work. A high note specialist, Bert can also play melodically and with a warm tone, as he proves in this version of "I'll Never Be The Same. Red Price's growing popularity as a vocalist on up-tempo, "beat" numbers tends to obscure his talents as a tenor saxophonist. Just how brilliantly he plays can be judged from an exciting performance of Cotton Tail, a theme originally by Duke Ellington to spotlight the playing of Ben Webster. Another of the band's Scotsmen, Eddie Blair is the most modern in style of all the trumpet soloists. Lullaby Of The Leaves, featuring his playing, begins in Latin-American idiom, goes into a steady four-four beat and ends as it began. From Billboard - October 28, 1957: Heath band, best selling of foreign entries, has a strong set here. Each member of ork gets a chance to blow solo, most often in full band setting. Arrangements by John Keating are typically excellent; solos are good, ofttimes stimulating, but tend to be heavily derivative of influential Americans. Try "Love For Sale" and "Lullaby Of The Leaves" as demo bands. From the back cover: In this album, the focus is all Pilita, the artist – versatile, distinct and far-reaching. 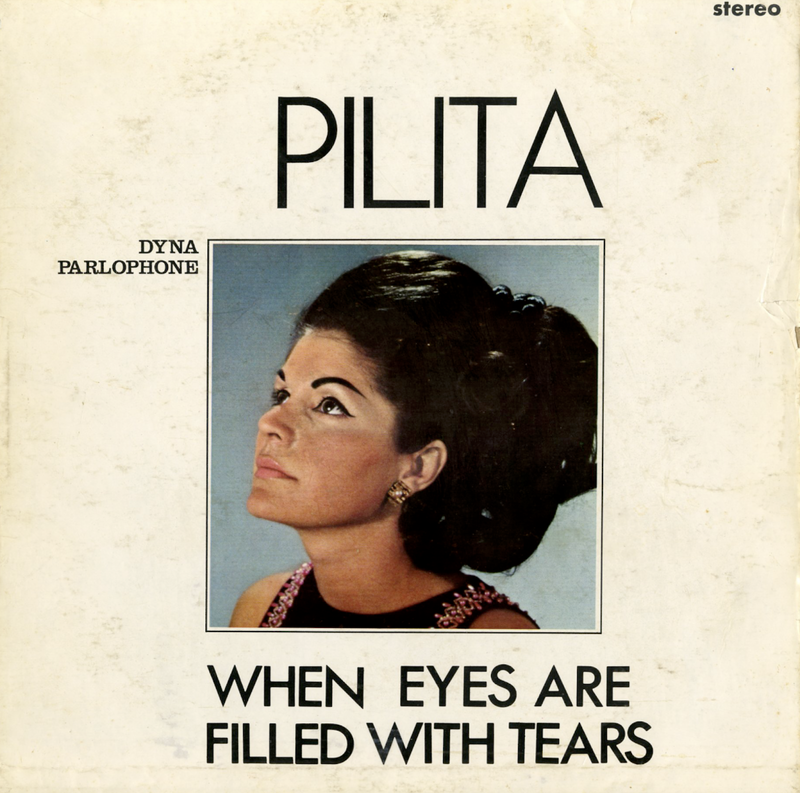 Featuring the new theme song ("When Eyes Are Filled With Tears") of her much awarded TV musical variety show "Your Evening With Pilita" now seen in living color and which characterizes, so to speak, the new image of Pilita. Four Corners Records - New York, N.Y.
Barcarole from "The Tales Of Hoffmann"
Hollywood, a land of fabulous success stories, can point to none more fabulous that that of Andre Previn. Young in years, a preponderance of experience has gained him recognition as one of America's outstanding concert pianists, an established recording artist and one of the screen's foremost musical composers and conductors at Metro-Goldwyn-Mayer where he has been employed since 1945. He is currently musical director for two of M-G-M's most important pictures – "Bells Are Ringing" and "The Subterraneans," both produced by Arthur Freed. Previn's talent has been channeled into all facets of the musical world – from arranger to composer-conductor and music director. In fourteen years he has composed and scored thirty pictures. He has been nominated for an Academy Award five times, and won the Oscar for ballet in "Invitation to The Dance." Truly a year of achievement, he received the Berlin Film Festival Award for his best original score in Metro-Goldwyn-Mayer's "Bad Day At Black Rock," and the "Downbeat" Poll in two categories: Best Motion Picture Composer and Best Motion Picture Arranger in 1958. 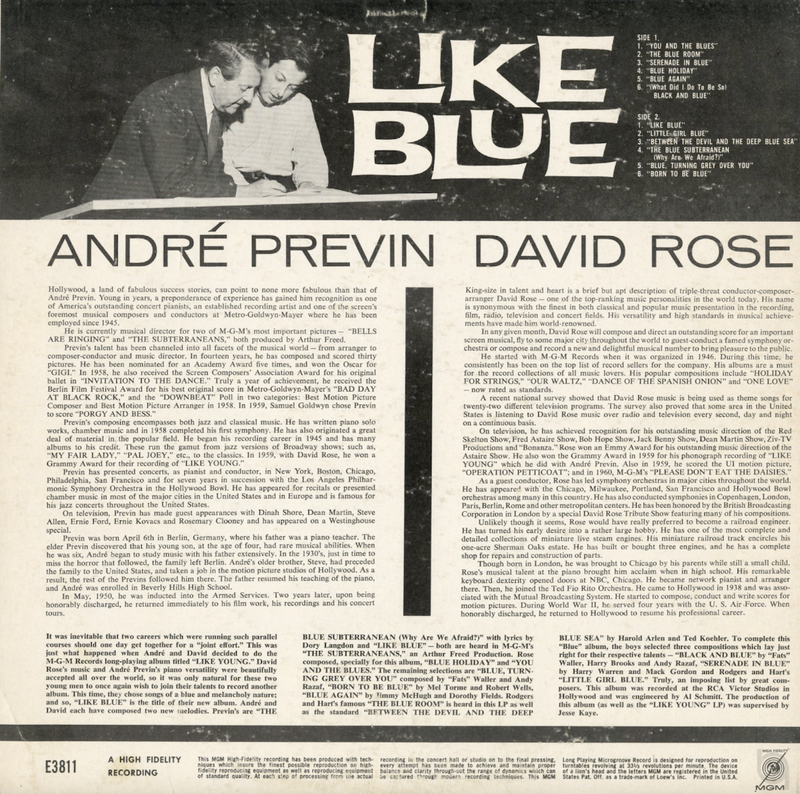 In 1959, Samuel Goldwyn chose Previn to score "Porgy And Bess." Previn's composing encompasses both jazz and classical music. He has written piano solo works, chamber music and in 1958 completed his first symphony. He has also originated a great deal of material in the popular field. He began his recording career in 1945 and has many albums to his credit. These run the gamut from jazz versions of Broadway shows, such as, "My Fair Lady," "Pal Joey," etc., to the classics. 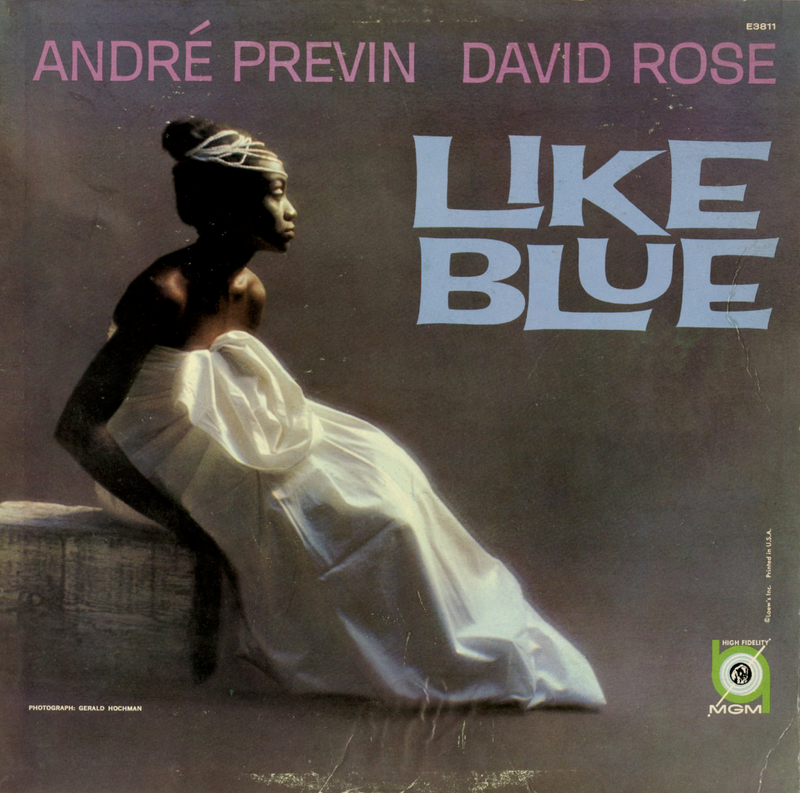 In 1959, with David Rose, he won a Grammy Award for their recording of "Like Young." Previn has presented concerts, as pianist and conductor, in New York, Boston, Chicago, Philadelphia, San Francisco and for seven years in succession with the Los Angeles Philharmonic Symphony Orchestra in the Hollywood Bowl. He has appeared for recitals or presented chamber music in most of the major cities in the United States and in Europe and is famous for his jazz concerts throughout the United States. On television, Previn has made guest appearances with Dinah Shore, Dean Martin, Steven Allen, Ernie Ford, Ernie Kovacs and Rosemary Clooney and has appeared on a Westinghouse special. Previn was born April 6th in Berlin, Germany, where his father was a piano teacher. The elder Previn discovered that his young son, at the age of four, had rare musical abilities. When he was six, Andre began to study music with his father extensively. In the 1930's, just in time to miss the horror that followed, the family left Berlin. Andre's older brother, Steve, had preceded the family to the United States, and taken a job in the motion picture studios of Hollywood. As a result, the rest of the Previns followed him there. The father resumed his teaching of the piano, and Andre was enrolled in Beverly Hills High School. In May, 1950, he was inducted into the Armed Services. Two years later, upon being honorably discharged, he returned immediately to his film work, his recordings and his concert tours. King-size in talent and heart is a brief but apt description of triple-threat conductor-composer-arranger David Rose – one of the top-ranking music personalties in the world today. His name is synonymous with the finest in both classical and popular music presentation in the recording, film, radio, television and concert fields. His versatility and high standards in musical achievements have made him world-renowned. In any given month, David Rose will compose and direct an outstanding score for an important screen musical, fly to some major city throughout the world to guest-conduct a famed symphony orchestra or compose and record a new and delightful musical number to bring pleasure to the public. He started with M-G-M Records when it was organized in 1946. During this time, he consistently has been on the top list of record sales for the company. His albums are a must for the record collections of all music lovers. His popular compositions include "Holiday For Strings," "Our Waltz," "Dance of The Spanish Onion" and "One Love" – now rated as standards. A recent national survey showed that David Rose music is being used as theme songs for twenty-two different television programs. The survey also proved that some areas in the United States is listening to David Rose music over radio and television every second, day and night on a continuous basis. On television, he has achieved recognition for his outstanding music direction of the Red Skelton Show, Fred Astaire Show, Bob Hope Show, Jack Benny Show, Dean Martin Show, Ziv-TV Productions and "Bonanza." Rose won an Emmy Award for his outstanding music directions of the Astaire Show. 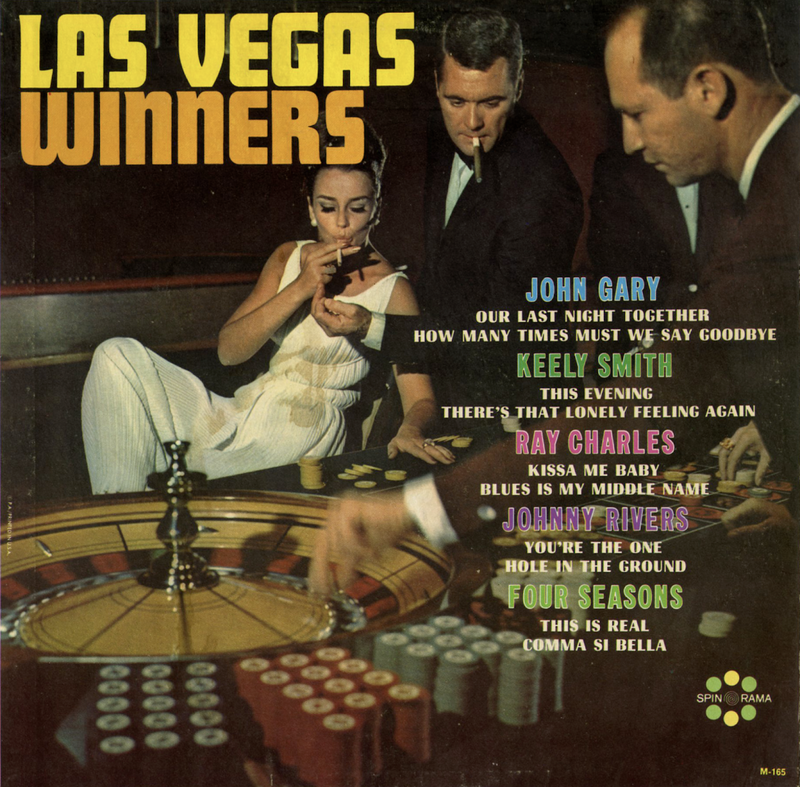 He also won the Grammy Award in 1959 for his phonograph recording of "Like Young" which he did with Andre Previn. Also in 1959, he scored the UI motion picture, "Operation Petticoat", and in 1960, M-G-M's "Please Don't Eat The Daisies." As a guest conductor, Rose has led symphony orchestras in major cities throughout the world. He has appeared with the Chicago, Milwaukee, Portland, San Francisco and Hollywood Bowl orchestras among many in this country. He has also conducted symphonies in Copenhagen, London, Paris, Berlin, Rome and other metropolitan centers. 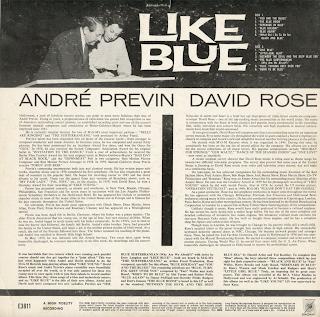 He has been honored by the British Broadcasting Corporation in London by a special David Rose Tribute Show featuring many of his compositions. Unlikely through it seems, Rose would have really preferred to become a railroad engineer. He has turned his early desire into a rather large hobby. He has one of the most complete and detailed collections of miniature live steam engines. His miniature railroad track encircles his one-acre Sherman Oaks estate. He has built or brought three engines, and he has a complete shop for repairs and construction of parts. Though born in London, he was brought to Chicago by his parents while still a small child. Rose's musical talent at the piano brought him acclaim when in high school. His remarkable keyboard dexterity opened doors at NBC, Chicago. He became network pianist and arranger there. Then, he joined the Ted Fio Rito Orchestra. He came to Hollywood in 1938 and was associated with the Mutual Broadcasting System. He started to compose, conduct and write scores for motion pictures. During World War II, he served four years with the U.S. Air Force. When honorably discharged, he returned to Hollywood to resume his professional career. Cover Photo by Lee-Myles Assoc. N.Y.C. Available form online vendors so I will not be posting a sample. Presented here to share the jacket art and notes. 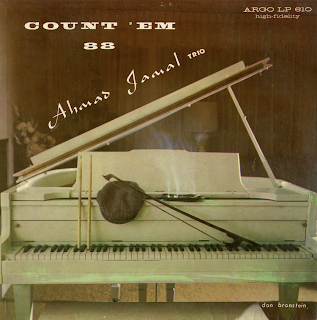 From the back cover: For some years now, Chicago has been fortunate enough to be the home base for the operations of pianist Ahmad Jamal. 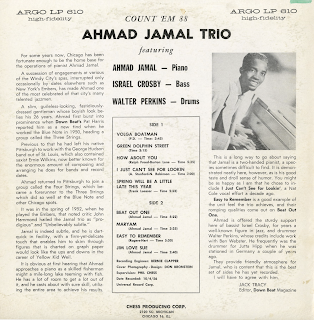 A succession of engagements at various of the Windy City's spas, interrupted only occasionally by dates elsewhere such as New York's Embers, has made Ahmad one of the most celebrated of that city's many talented jazzmen. A slim, guileless-looking, fastidiously dressed gentlemen whose boyish look belies his 26 years. Ahmad first burst into prominence when Down Beat's Pat Harris reported him as a new tind when he worked the Blue Note in 1950, heading a group called the Three Strings. Previous to that he had left his native Pittsburgh to work with the George Hudson band out of St. Louis, which also contained saxist Ernie Wilkins, now better known for the enormous amount of composing and arranging he does for bands and record dates. It was in the spring of 1952, when he played the Embers, that noted critic John Hammond hailed the Jamal trio as "prodigious" and "Unbelievably subtle." Jamal is indeed subtle, and he is dart-quick in facility, with a firm-yet-delicate touch that enable him to skim through figures that is charted on graph paper would look like the ups and downs in the career of Yellow Kid Weil. 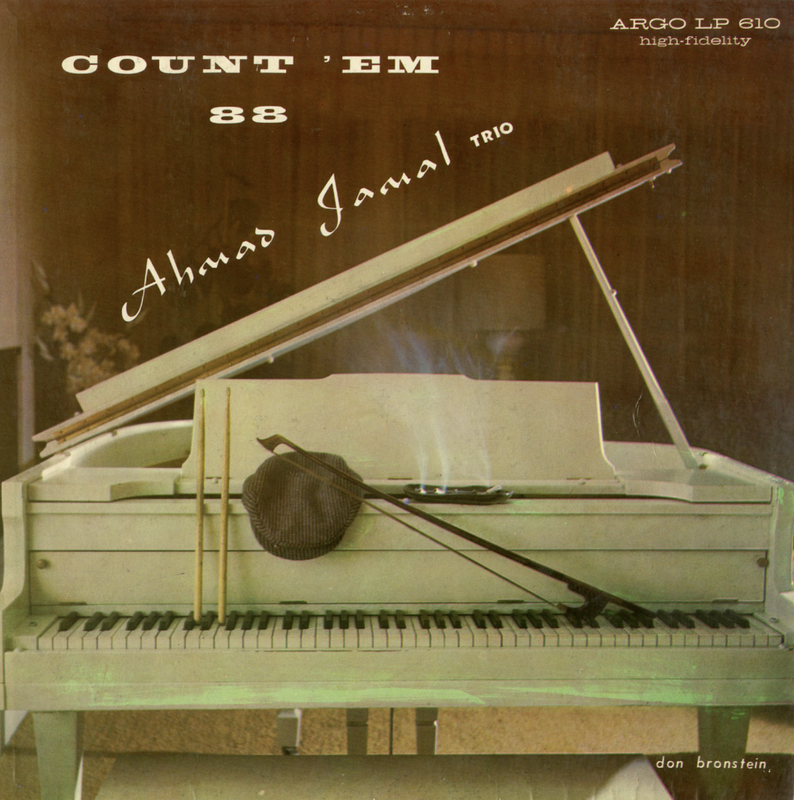 It is obvious at first hearing that Ahmad approaches a piano as a skilled fisherman might a mile-long lake teeming with fish. He has a lot of room to get a lot out of it, and he casts about with sure skill, utilizing the entire area to achieve his results. This is a long way to go about saying that Jamal is a two-handed pianist, a species sometimes difficult to find. It is demonstrated neatly here, however, as is his good taste and droll sense of humor. You might be as happy as I am that he chose to include I Just Can't See For Looking', a Nat Cole vocal effort a decade ago. Easy To Remember is a good example of the unit feel the trio achieves, and their romping qualities come out on Beat Out One. 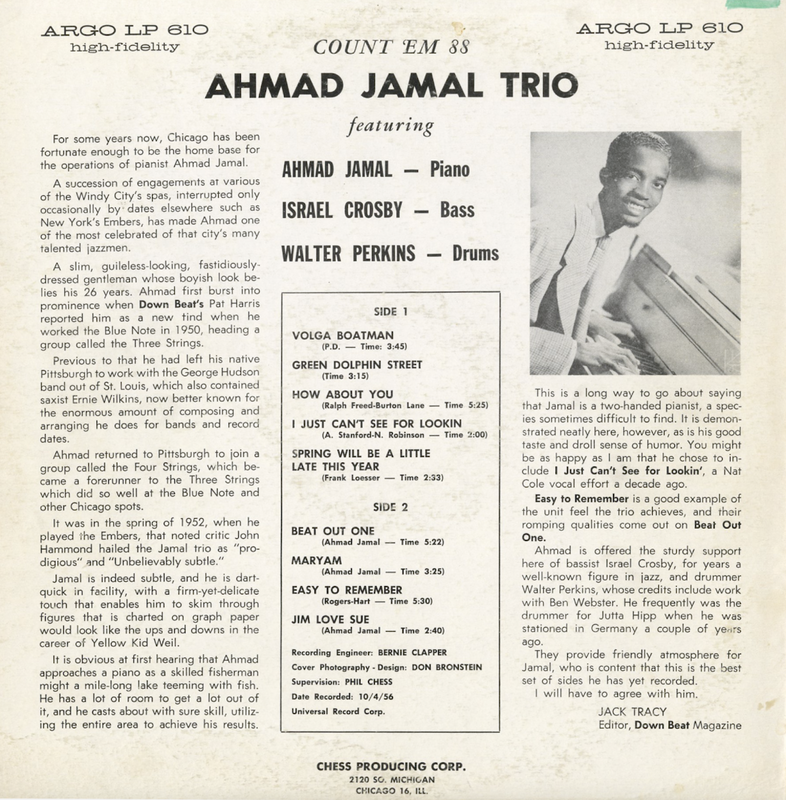 Ahmad is offered the sturdy support here of bassist Israel Crosby, for years a well-known figure in jazz, and drummer Walter Perkins, whose credits include work with Ben Webster. He frequently was the drummer for Jute Hipp when he was stationed in Germany a couple of years ago. They provide friendly atmosphere for Jamal, who is content that this is the best set of sides he has yet recorded. I will have to agree with him. Jack Tracy - Editor, Down Beat Magazine. 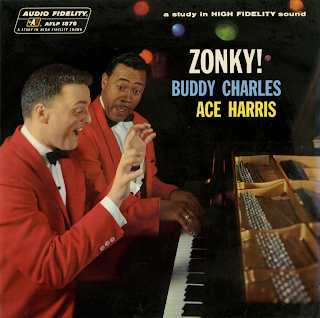 From the back cover: Ace Harris and Buddy Charles owe their professional success as jazz duo-pianists to combination of top drawer talent, circumstances and convenience. Originally a pianist with the Ernest Hawkins orchestra, Ace Harris was in on the making of the original "Tennessee Waltz" recording. The two pianists as soloists had roamed the country doing club dates. One day they found themselves alternating as solo pianists in the Junior Room of the famous Black Orchid in Chicago. 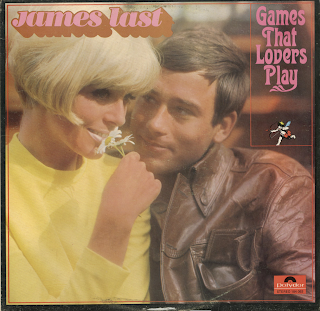 about two-third of their working time was spent in solo playing. The other on-third of their working time was spent playing duo-piano, while they overlapped in changing places. During this period they appeared to win more listeners and to generate more interest in their playing, with the result that a duo-piano team was born. Since their merger, Ace and Buddy have found that they have enjoyed twice the popularity and success that might have been expected as a result of their doubling on the ivories. From the back cover: The story of Joe Sherman and George David Weiss, the producers of this album, and writers of eight of its songs, is a fantastic one. 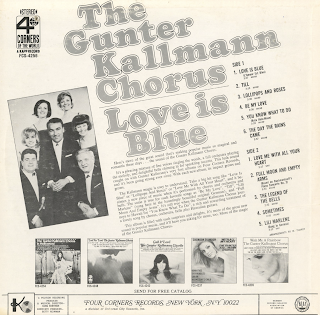 Prior to this year, each had achieved notable success in his own right: Joe, as arranger-conductor for Paul Anka, Connie Francis, Roy Hamilton, Jack Lemmon, Sal Mineo, etc., as A&R man for Epic Records, and as a hit songwriter, (Rambling Rose, Eso Best, For Favor, To The Ends Of The Earth, etc.). 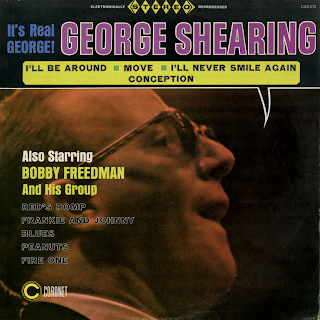 George, as arranger for Stan Kenton, Vincent Lopez, Johnny Richards, etc., as a Broadway and Hollywood composer, (Mr. Wonderful, Blue Hawaii, Gidget Goes To Rome, Murder, Inc., etc. ), and as a hit songwriter, (Too Close For Comfort, Wheel Of Fortune, Cross Over The Bridge, Oh What It Seemed To Be, etc.). In 1963 they teamed up to write one of Nat Cole's biggest hits, "That Sunday, That Summer, (If I Had To Choose)", which is beautifully represented in this album. They then combined their diverse talents, (each writes words and music) to not only write the picture song, "Toys In The Attic" (in colaboration with George Duning) but also to produce the record which you, the people, loved so well. In it, the boys displayed their imagination by combining the instrumental and vocal sounds that have given the Joe Sherman orchestra and chorus its uniqueness and commerciality. 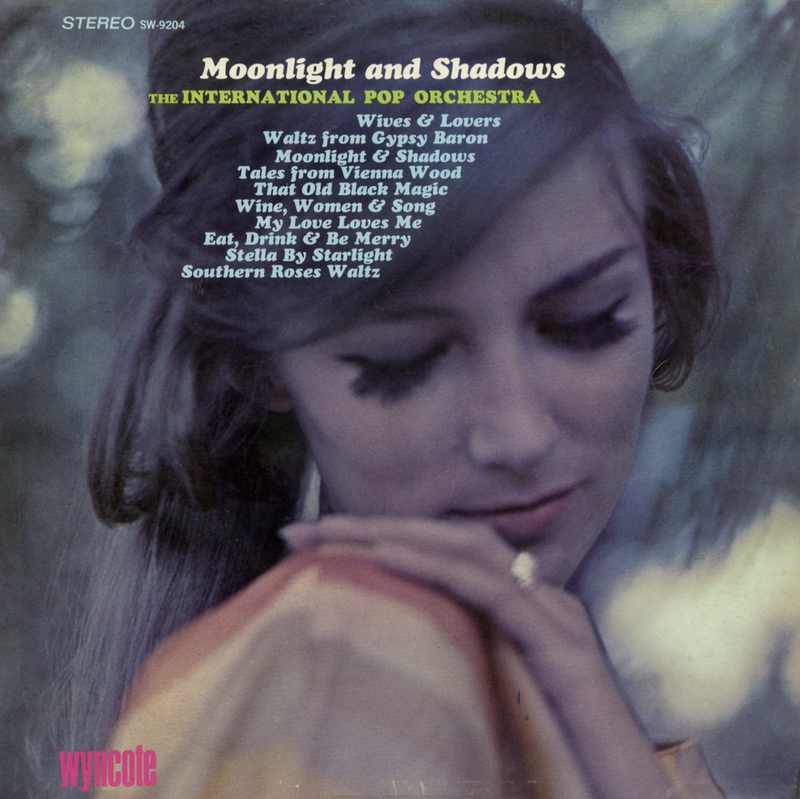 From Billboard - August 29, 1964: A zesty package of light and bright instrumental-choral renditions of current motion picture themes and music. 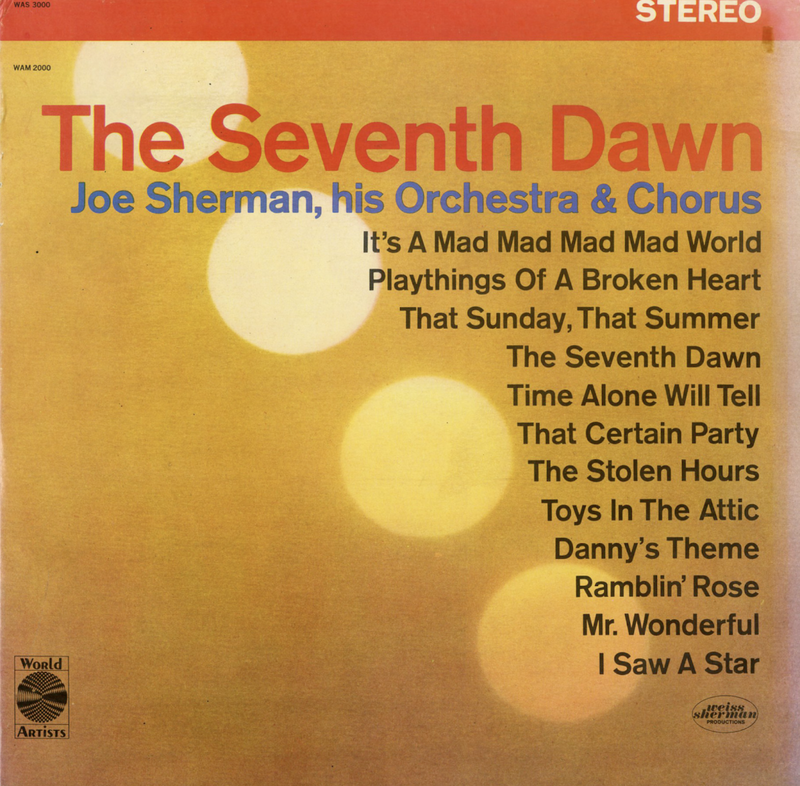 Selections include "It's A Mad, Mad, Mad, Mad World," "Toys In The Attic," "The Seventh Dawn" and "Stolen Hours," as well as top-notch Weiss-Sherman tunes "That Sunday That Summer," "Time Alone Will Tell," "I Saw A Star" and "That Certain Party In Apt. 14C." A Product of Synthetic Plastics Co.
A split disc between Shearing and Freedman. The engineering or the "reprocessing" of mono to strereo on Shearing's side sounds pretty awful. In contrast the sound on Freedman's side (B) is, by far, better even if not necessarily "stereo" worthy. Available from online vendors so I will not be posting a sample. Presented here to share jacket notes excerpts and Billboard article. From the back cover: The Trio consists of George plus the celebrated rhythm duo of drummer Vernel Fournier and the late string bass star, Israel Crosby... both of whom gained considerable reputation for their contributions to the famed Ahmad Jamal group. 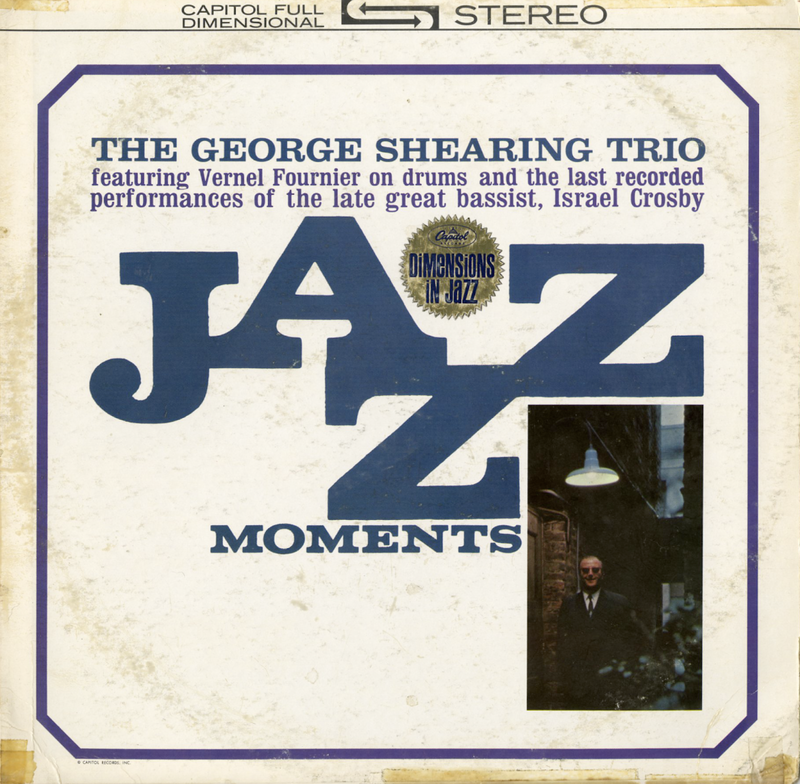 Oddly enough, it is here, in his last recording, that some of Crosby's rare solo work can be heard, as he and Fournier complement Shearing's inventive playing with impeccable rhythmic backing throughout the album. Also from the back cover an excerpt from Downbeat - September 27, 1962: When Ahmad Jamal broke up his trio last spring, George Shearing wasted no time in hiring Jamal's bassist, Israel Crosby. While still in his native Britain, Shearing first heard Crosby on Blues Of Israel, recorded with Gene Krupa and released in this country on Decca in the late 30s. He closely followed the bassist's career from that time. Early last month, while the Shearing quintet was at the University of Utah's jazz workshop, Crosby was not in the group; he had suffered blinding headaches and blurred vision and had taken a two-week leave of absence to return to Chicago, his home, for a hospital checkup. But before the group left the university, Shearing had received a letter from the bassist in which he said he'd soon be well enough to return to the quintet. But Crosby never returned; he died of a blood clot on the heart in Chicago's West Side Veterans Administration Hospital on Aug. 11. He was 43. "As much rapport as I had with Al McKibbon," Shearing said, referring to the bassist who worked with him for several years, "I had as much with Israel – and he was only with me a short time. If he'd been with me longer, it would have been greater. 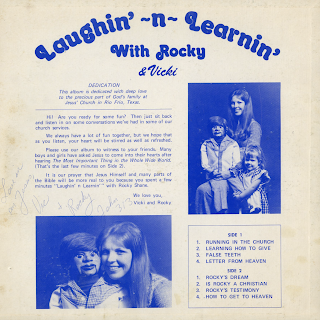 "Fortunately, we made this trio album at Basin Street East. It was the fastest album I ever mad. He played bass parts that were so beautiful; you could never write anything as good. He was one of the most inspiring musicians I ever played with. When asked who would take his place, Shearing said, "I don't think anybody is going to take his place; nobody took Art Tatum's place..."
From Billboard -Feburary 9, 1963: Capitol Jumps Back Into Jazz Stressing Lesser Known Names - Capitol Records is back in the jazz business with a vengeance. The label is kicking off a new line of album product featuring modern jazz artists that will be keynoted by youth and individuality. The new series on the West Coast major is being referred to as "Dimensions In Jazz" and it will share a special trade-mark space with the usual Capitol logo. Emphasis for the "Dimensions In Jazz" line will be new talent. The label is centering on lesser known names on the general market. Men like Jimmie Rowles, Joe Bucci, Jack Sheldon and John Grey are certainly not new to those familiar with the jazz trade. Rowles is the pianist on the West Coast who has arranged for and recorded with Peggy Lee and a variety of top line artists. His first Capitol set in the new series features a quartet in "Kinda Groovy." Sheldon was in the vanguard during the popularity of the so-called West Coast school of jazz. The trumpeter has always been among the top clique of studio jazz men and has played with the leading jazz musicians on the Coast. Bucci is a jazz organist who scored impressively at the Newport Festival last year. His first set is "Wild About Bassie." John Grey is a newcomer on guitar who has played with a good many group. Buddy DeFranco among them. 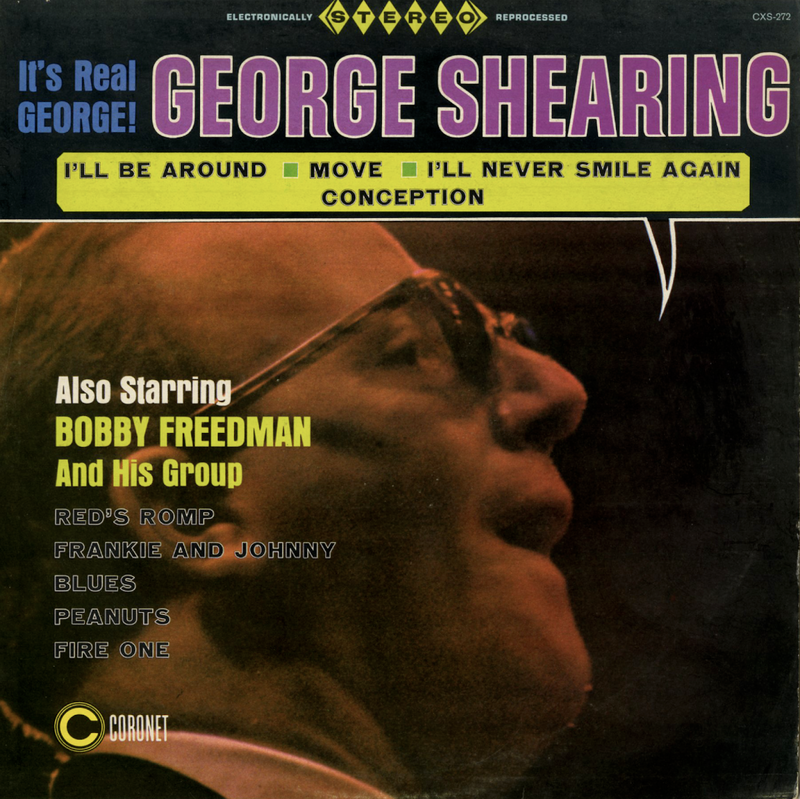 Leading the new "Dimensions In Jazz" series is an album which showcases George Shearing playing minus his quartet. The pianist, instead, is showcased with an all-star rhythm team that includes the late Israel Crosby and Vernel Fournier. These two men make up to thirds of the Ahmad Jamal trio.